The day started well until a loud explosive air hiss came from below our feet in our new truck. Most thought that a tyre had blown out. We came to a slower stop than I would have expected for such an event. 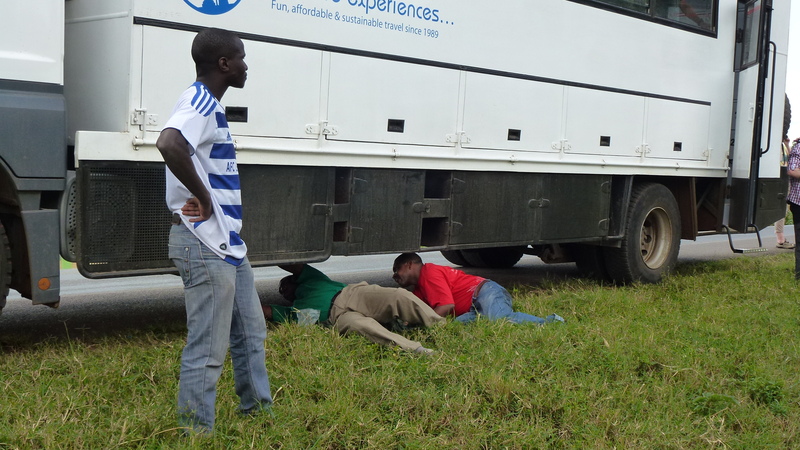 The driver wriggled under the vehicle amidships and attempted to fix a high pressure air supply line. Being a new truck that had not been properly fitted out for our trip there was only a screwdriver available to fix the problem. A call was put out to anyone who had any tape. This, of course, made little impact on the problem due to the high pressure involved. We deduced that the air line had something to do with the breaks. Eventually the driver somewhat admitted defeat when he went across the road to a service station and came back with a bicycle inner tube. This, along with some more tape, actually did the job. We were off after a one and three quarter hour stop. Whilst all this was happening most of the younger guys and one of the girls kicked a soccer ball around on a large grassy field beside where we had stopped. Great fun was had by all until it was time to leave. The biggest boy in the group grabbed the ball and made off with it on his bicycle. We had naively hoped that the ball could have been shared a little more equally by those involved in the game – how silly of us! 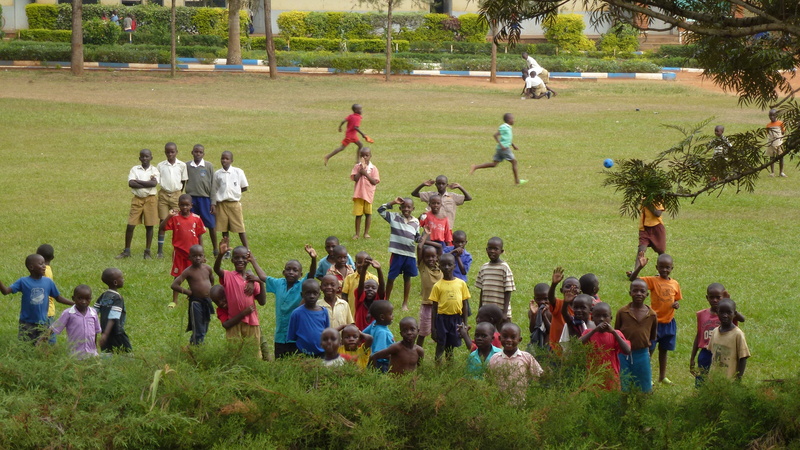 The Ugandan border was not all that far away. 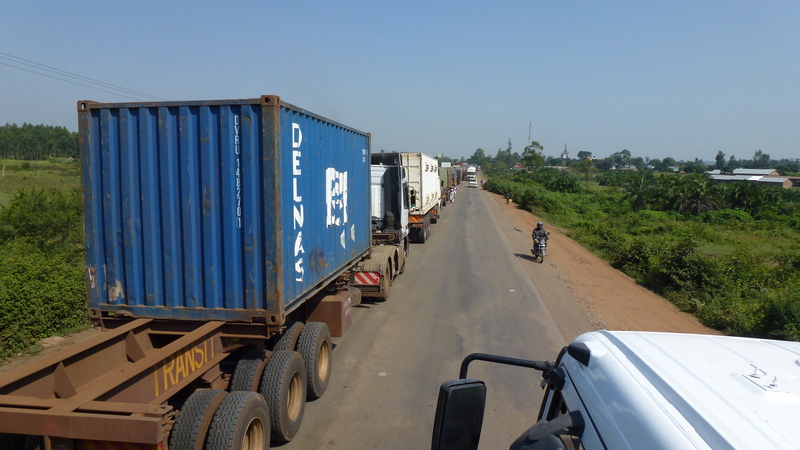 We passed many, many trucks all lined up waiting their turn to be processed. I counted over 100 on our way back. The drivers can expect to wait from three to seven days to get through the paperwork and inspections. Once we arrived at the border, foreigners in buses are given priority, we lined up at the appropriate windows to be processed without trouble. That was until it was my turn! I handed my passport through the window to the Immigration officer on the other side. He looked at it hard and long and then motioned me to come into his office through a nearby door. He said my visa had expired, as indeed, on my inspection, it had! I had been given a Transit Visa on arrival at Nairobi airport by the lady Immigration officer. This was valid for a 72 hour stop. She asked me how long I was staying, to which I said I was leaving on the 17th and, did she want to see my itinerary? She said she didn’t and gave me the visa. I guess I was partly to blame as I should have known that I was to be in Kenya for four days not three, but after X hundreds of hours on the go, through various time zones etc. the error did not compute with me either. So, now back to leaving Kenya. The Immigration officer quizzed me on why I had a Transit Visa if I was to be in Kenya for four days. I explained that his colleague in Nairobi had made the decision to issue me a Transit Visa. He said I hadn’t paid enough. I said that I was not trying to avoid paying whatever I should have and could I pay the extra now. He ignored me while he attended to other people who passed their ‘all-in-order’ passports through his window. I wondered what was going to happen. He eventually returned to my passport and asked if I was coming back to Kenya? Yes, was my answer. How long will you be staying? Overnight, I ventured as an answer. He picked up his visa stamp and slammed it down on my Transit Visa and said, this is an official warning, and handed me back my passport. Somewhat relieved, I meekly left his presence saying ‘asanti sana’, thank you very much. 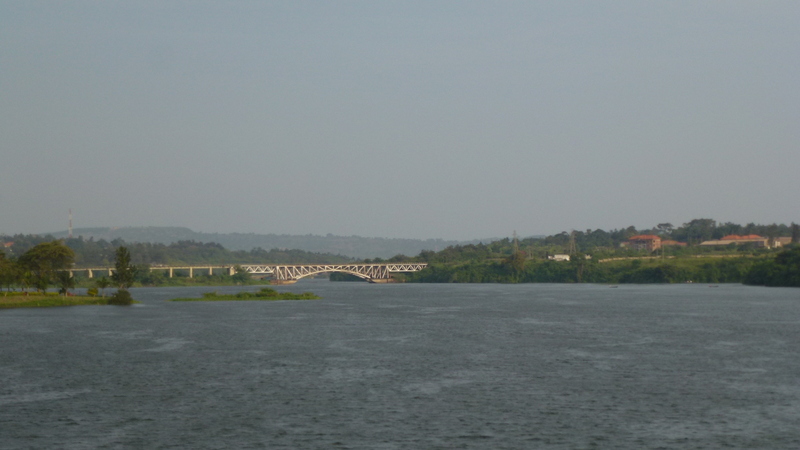 We ALL continued on our way to our camping place at the Red Chilli in Kampala, crossing the Nile River at Jinja on the way. We were to return to Jinja for a two night stop on our way back to Nairobi. Along the way we passed black and blue cloth traps. These were about 750mm x 750mm x 750mm and were seen swinging in trees. Ingwe explained that they were traps for tse-tse fly, in other words, the insect that causes sleeping sickness.